Below is a video demonstrating how Agilent's M9183A PXI DMM is over 10 times faster in a transactional test setup compared to Brand X's PXI DMM (you can probably guess who Brand X is). Transactional testing refers to automated test setups where the DMM and switching has to be reconfigured for each measurement or test point on the DUT. That means at each test point the DMM is configured, armed (*INIT command), and the measurement is fetched from memory into the test software.Everything in the test is the same except the DMMs so each test setup has the same switching, same PXI chassis, same code, and the DMM measurement aperture time is the same. Check out the video below. The reason that Brand X's DMM is so much slower is because its measurement arming time is ~ 6 ms! Agilent's M9183A measurement arming time is < 100 us. With an arm time of 6 ms Brand X is wasting the benefit gained by the high speed PXI bus. In fact, with such a large arm time a 'box' DMM using USB, LAN, or GPIB is faster. For instance Agilent's 34410A DMM takes only ~ 2 ms to make a measurement (that is including IO latency). N6783A-BAT: designed for charge and discharge testing of mobile device batteries. N6783A-MFG: designed for mobile device manufacturing to simulate the battery and characterize the mobile device’s current draw. The N6783A-BAT and N6783A-MFG modules are made for the N6700B Modular Power System mainframe and N6705B DC Power Analyzer mainframe. The N6700B is optimized for system test with a 1U full rack size. N6705B is optimized for bench-top use with all controls accessible from the front panel and a scope like display for analyzing digitized current and voltage measurements. Here is a closer look at the N6783A-BAT and N6783A-MFG modules. 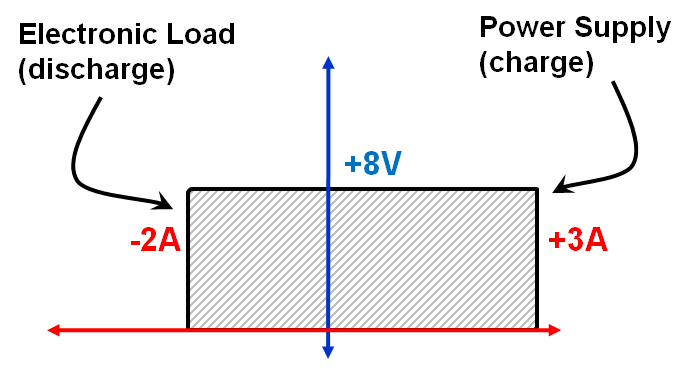 Basic programmable electronic load for discharging batteries. Basic programmable power supply for charging batteries. Suitable for battery validation and conditioning. Complimentary, low-cost alternative to the N6781A for battery cycling only. For more info on the N6781A check out the June 27th 2010 post. Excellent voltage transient response, < 75 mV of droop, < 45 µs response time in response to 0.15A / µs transients. Built-in digitizer for fast, accurate, flexible measurements that are customizable to the level of speed and accuracy desired. 18 W of power, voltage 6 V, and Current at -2 A, 0 to 3 A. Since the N6783A-BAT and N6783A-MFG are modular you can mix and match them with any of the over 20 power modules available for the N6700B and N6705B mainframes. Agilent’s N6781A and N6782A SMU modules, for the N6700 and N6705 modular power systems, provide cutting edge technology for battery drain analysis and low power design. These SMUs provide low current measurement capability, fast transient response, and digitized measurements for characterizing dynamic current. But what sets these solutions apart from anything else on the market is their seamless current ranging capability. The seamless current ranging capability allows the N6781A and N6782A to seamlessly change current measurement ranges without any discontinuities in the output. See my 6/27/10 post for more details on the patented seamless current ranging capability. The N6781A and N6782A were specifically targeted at the mobile phone and smart device markets, but they are also proving an ideal solution for other battery powered devices such as wireless sensors. In this post I want to share some details on how a designer of wireless temperature / humidity sensors used the N6782A SMU module as a tool for optimizing their design for low power consumption. Below is a screen shot from the 14585A software using digitized measurements from the N6782A SMU module (click to enlarge). The 14585A software, among other things, provides a scope like display of digitized current and voltage measurements from the N6705B mainframe. In the screen shot above you can see two current pulses representing the data transmit cycle of the sensor under test. The pulses peak around 14 mA with a sleep current around 4 uA. In the screen shot below we zoomed in on the start of one of the pulses. As you can see the ~400 ms pulse is really a group of pulses representing transmitted bits. Circled in red is a 2 mA step representing an LED turn-on. As you can see the LED turns on about 15 ms before the transmit cycle actually begins. By delaying the LED turn-on by ~15 ms the designer could lower the sensor’s power consumption and increase battery life. When we used the N6782A to capture the current profile of the T/H sensor we used the seamless current ranging. When the T/H sensor was in a sleep state (current in uA region) the N6782A was using its 1 mA current measurement range as the current consumption began to shoot up because of the start of a data transmission the N6782A seamlessly switched to its 100 mA current measurement range. This means we captured 18 bits of measurement resolution throughout the current capture. Let’s use that resolution to zoom in on the sleep current as shown in the screen shot below. The N6782A is sampling at 5 us period and the screen shot above is showing about 1.5 s worth of data. Since there are too many data points to view the 14585A software decimates the data and shows three traces: a min, max, and average trace. Notice the current anomalies circled in red. They occurred on regular intervals of about 0.9 s. In the screen shot below we take a closer look at the anomalies in the sleep current. Here we zoomed on the sleep current anomaly and placed markers around it. The average current around the anomaly is ~6 uA while the average current during the anomaly is ~11 uA. Since the T/H sensor runs for >1 year before a battery change, eliminating the anomaly will significantly add to the device’s battery life. The whole point being that the anomaly was easy to spot with the N6782A low current measurement capability and its high speed current digitizer. And remember all the current measurement points we looked at in this post, from the pulses to the sleep current, were captured with a single data log measurement. This was made possible by the seamless current ranging capability which ensures we got 18 bits of measurement resolution from the sleep current to the transmit pulse peak current. Without the seamless ranging we would have to make multiple data log measurements of the current, each at a different measurement range, and try and superimpose the data together. The designer of the sensor plans to use the N6782A, the N6705B mainframe, and the 14585A current analysis software to help them reduce the size and increase the battery life of their sensor design. On May 27th Agilent released the first LXI direct instrument control application for iOS based smart devices like the iPhone, iPod, and iPad. The app allows you to control and monitor Agilent's popular 34972A LXI Data Acquisition Unit. The 34972A is often used for remote and / or long term DAQ applications so it is a great fit for monitoring and controlling via a mobile device. The 34972A DAQ app was developed by yours truly with some help from a colleague on Agilent's R&D software team. The 34972A DAQ app can be downloaded free of charge from the App Store. A link to the 34972A DAQ app can be found below at the end of this blog post. I also wanted to advertise an article I wrote that was published by Evaluation Engineering entitled "Controlling LXI Instrumentation With Smart Devices." The article is based on my experiences creating the 34972A DAQ app. It discusses network hurdles you face when communicating with LXI instrumentation via a smart device and some of the coding complexities you face when creating LXI instrumentation control software for smart device. The link for the article can be found below. Finally if you are interested in getting started creating your own LXI instrument control software for the iOS platform I can send you some free code for a simple example app I created. The app is called "StarIDN." The StarIDN app will connect to an LXI instrument, send the "*IDN" SCPI command to the instrument, and display the result. If you are interested in the sample code send me an email at neil_forcier@agilent.com. You can open the sample app using Apple's Xcode development environment by navigating to the "StarIDN.xcodeproj" file in the app's folder. Downloading Xcode and running the StarIDN app in the iPhone / iPad simulator that Xcode provides is totally free. If you want to run the app on a real iOS device or submit a finished app to the iTunes App Store you will have to dish out $99. Use the following link to get started as an iOS developer http://developer.apple.com/devcenter/ios/index.action.